You might remember reading a post about Grandpa’s girlfriend before Grandma in “Grandpa’s Girlfriend.” I noticed a later entry in the Memory Book where he was asked if his mother liked Grandma. He wrote that she never liked any girls he dated, but that she “accepted” Grandma. As well she should. By then, Cora, Grandpa’s mother, was dying (the spindle cell cancer that was in her death certificate that I posted the other day) and he was devoting his life to taking care of her. He didn’t have a job at the time. 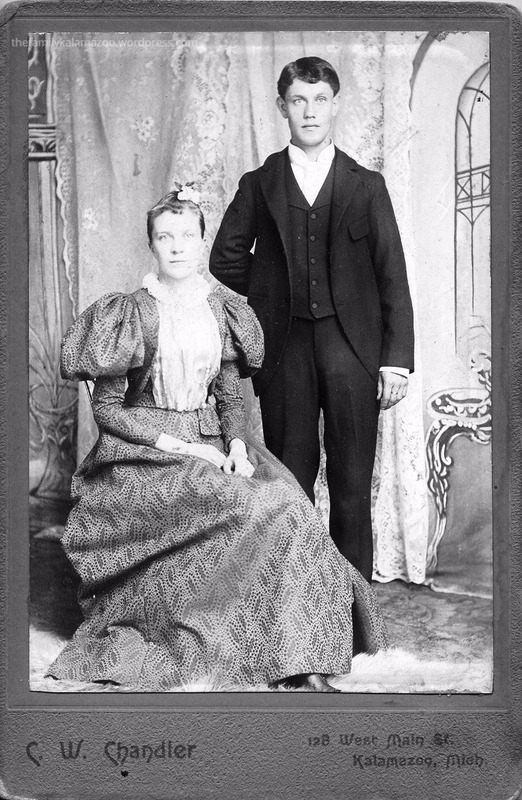 When he married Grandma, she not only helped him take care of his mother, but she worked full-time as a teacher, as well, that first year. 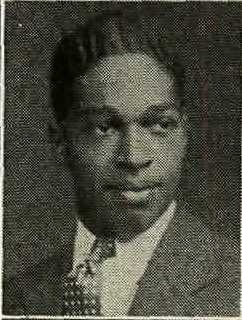 Another person that was important to Grandpa was the person he identified in the Memory Book as his best friend: Clarence Pettiford. He wrote, “Clarence Pettiford had good values and was nice to be around.” When I was a little girl and Grandpa was still living in the same neighborhood–and had his Sunoco Station there, too–Clarence also still lived in the neighborhood. The way I knew Clarence was that Grandma and I would walk “uptown” to the downtown bank with the service station deposits–or take the bus if the weather was rainy or too hot. We would always stop and visit the man I thought was the most important banker in the elegant bank at the corner of Burdick and Michigan. He was known to me as “Mr. Pettiford,” and he was always so very nice to me. I thought he was such a fine gentleman in both the way he acted and his tall distinguished appearance. When I got older, it was a little surprising to me to learn that he was in charge of security, rather than the head banker. Grandpa wasn’t able to attend high school because he was blind in one eye, and it caused him a lot of distress. 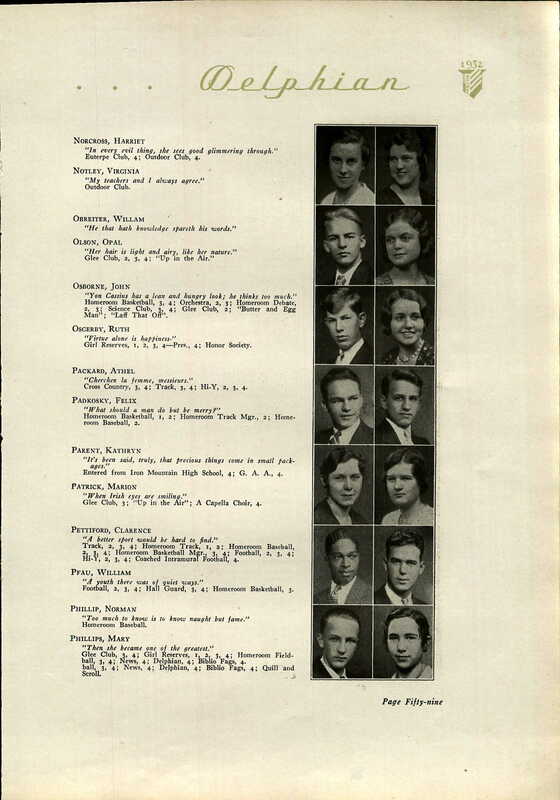 But Clarence did attend Kalamazoo Central High School, and I was able to find a photo of him in the yearbook. I apologize for the quality of the photos–they are from the Delphian and not the best quality. You can see that Clarence was quite the athlete. Grandpa also loved sports, but he would get sick from following the ball because of his bad eye. You can read what happened to his eye here. Clarence was about 3 years younger than Grandpa, but maybe the nearest boy who wasn’t a relative. Grandpa had about 7 boy cousins who lived nearby, but I imagine it was hard to be an only child and hang around with 7 boy cousins who were all brothers. 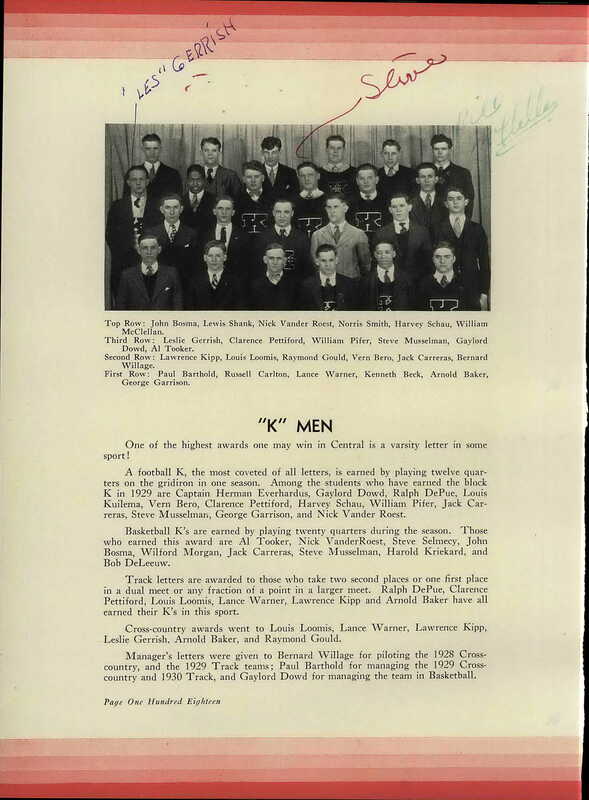 Back to Clarence: he lettered in football in 1930. He must have been 19 at the time. And in 1932, he must have been 21. The age is a little off, I know, but there might have been reasons that we don’t know. My other grandfather, for instance, immigrated from Europe when he was fourteen, and he was still playing football and declaiming in Glee Club for his high school when he was 21. Oh my, did you read what it says about the Intramural Team? It’s for boys not talented enough for varsity or the reserve team. Yikes. Did they have to spell it out like that? This blog post is a little tribute to the memory of Clarence Pettiford, a talented gentleman. The other day I posted Richard DeKorn’s death certificate from Kalamazoo and asked for help with the cause of death. Readers were very helpful, and I’m so appreciative. 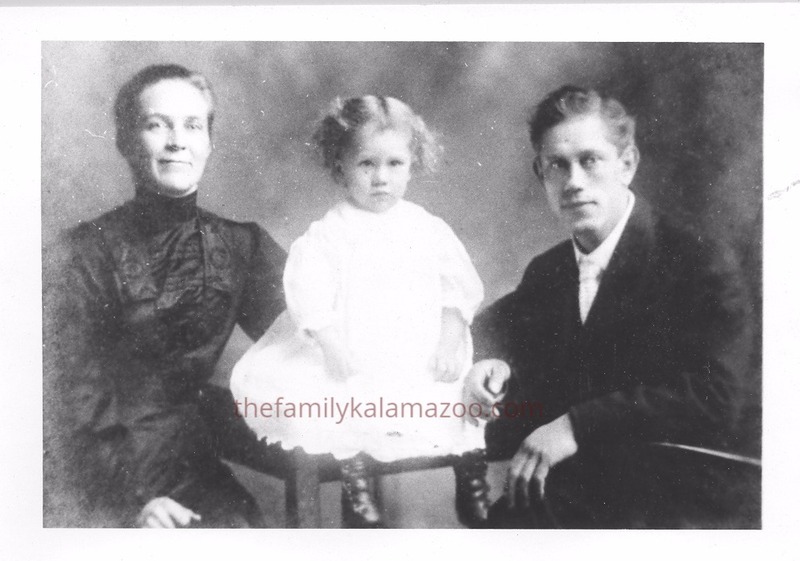 I mentioned at the time that Richard’s daughter and Grandpa’s mother, Cora DeKorn Zuidweg (Mrs. Adrian Zuidweg), wasn’t in the register of deaths. 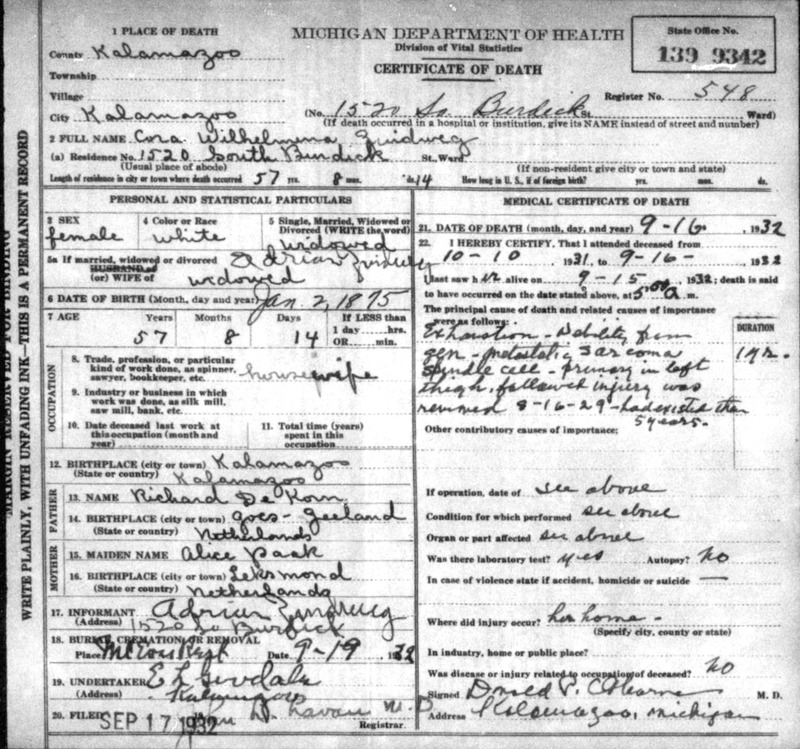 Two readers kindly sent me Cora’s death certificate that they found on the Seeking Michigan website. Cora is a particularly intriguing person to me because Grandpa and Grandma used to tell me that I looked a lot like her, especially with my hair pulled back. Cora always wore her hair up. The first time I saw this picture of Cora I was in my 20s and felt as if I was looking into a mirror. Also, Grandpa’s stories about her included stories of her love for animals and her courage to defend them. I feel a real affinity in the area of love of animals and wish I had her courage. What I knew about Cora’s death was that she had cancer that had spread throughout her body and her brain became confused from the disease. I also knew that she was dying when my grandparents got married. That explains why they got married out of town and on their own. My grandmother moved into the house with Grandpa and his mother and took care of her until she died a few months later. Exhaustion – debility from gen – metastatic sarcoma spindle cell – primary in left thigh, followed injury was removed 9-16-29 – had existed there 5 years. I believe that it is what it says. So cancer that started in her left thigh. Cancer that, according to Google, would be treated with chemo today. If caught in time, the results would probably be positive. Spindle cell sarcoma apparently is a connective tissue cancer. I thought that was a little bit of a coincidence because it seems that Cora had the cancer since she was about 52 and when I was 50 I had a tumor in my foot. While my tumor turned out not to be cancer, it was a giant cell reparative granuloma, which means that it has some characteristics of cancer (possibility of metastasizing and also destruction and replacement of healthy tissue). My tumor is the type that also reacts to injury or pressure, as Cora’s did. After checking out more on Google, I also learned that Giant Cell tumors can turn into cancer if left untreated–and sometimes into spindle cell. Notice that Cora’s original tumor wasn’t removed until 1929, about two years into her diagnosis. All very curious. I know that I am lucky that I got 21st century medical care for my foot. 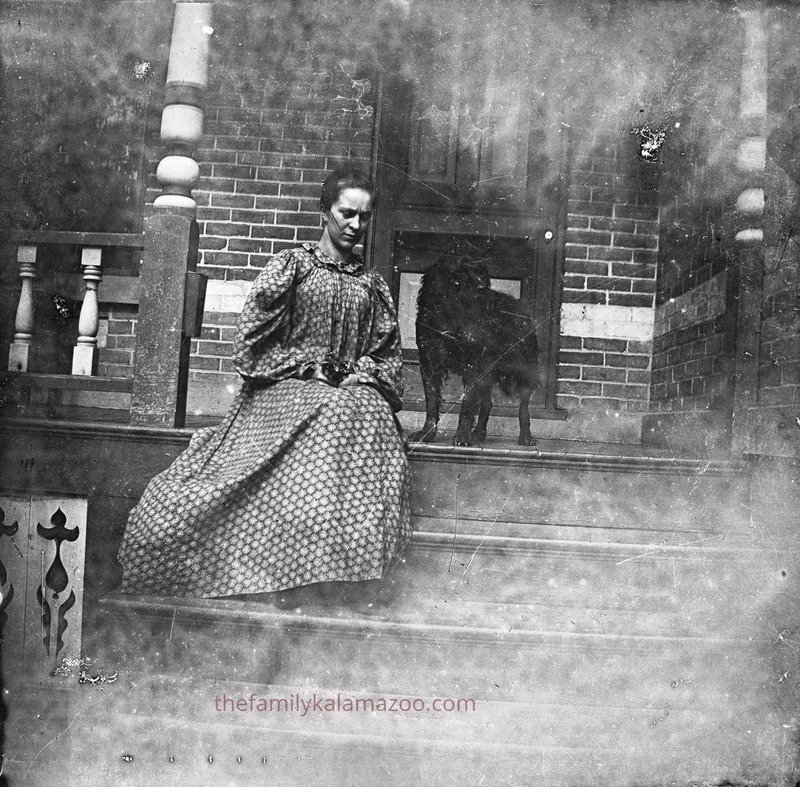 Cora passed away at age 57, never meeting her three grandchildren. My mother would be born less than two years after Cora’s death.